Mark Gulotta and Gulotta’s Inc. The Disch-DeClouet Social Service Center Community Supporter of the Year for 2019 is Mr. Mark Gulotta and Gulotta’s Inc. Mark comes from a close-knit family that has lived in New Iberia for several generations and has run Gulotta’s for over a hundred years. Mark said about his connection to the Disch-DeClouet Social Service Center, “When the Center was getting started in the seventies and I was in high school, we needed to so some community work and I chose the Center. I did some cleaning and I remember painting the handshake logo that is used today. I always admired the work that the DeClouets did for the community and followed in the footsteps of my Mom and Dad (Paul and Juanita) who give generously to the Center. 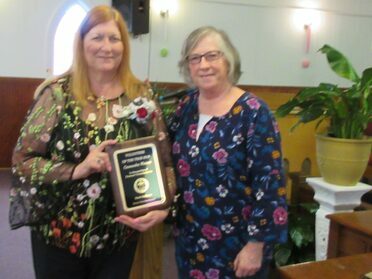 I guess it just came naturally to me, watching my parents do good work and wanting to continue another great tradition in New Iberia.” The award was given in recognition of Mark’s commitment and generosity in helping the Center clients with work boots, work clothing, school uniforms, and other items throughout the years, as well as donating annually to the Center. His assistance with work boots and work clothing has made a difference in so many lives. People who had jobs, but not the required boots and clothing, would never have been able to start working in the jobs that made such a difference to their lives and that of their families. The Disch-DeClouet Social Service Center Volunteer of the Year for 2018 is Mrs. Cassandra Watson. Cassandra was born in New Orleans and grew up in Slidell. She moved about the Southeast, working for Bell South and helping people wherever she went. Cassandra came to New Iberia when she married Donnie Watson. Since then she has been involved in many community and Church projects, including being on the volunteer landscaping committee at St. Peter’s. 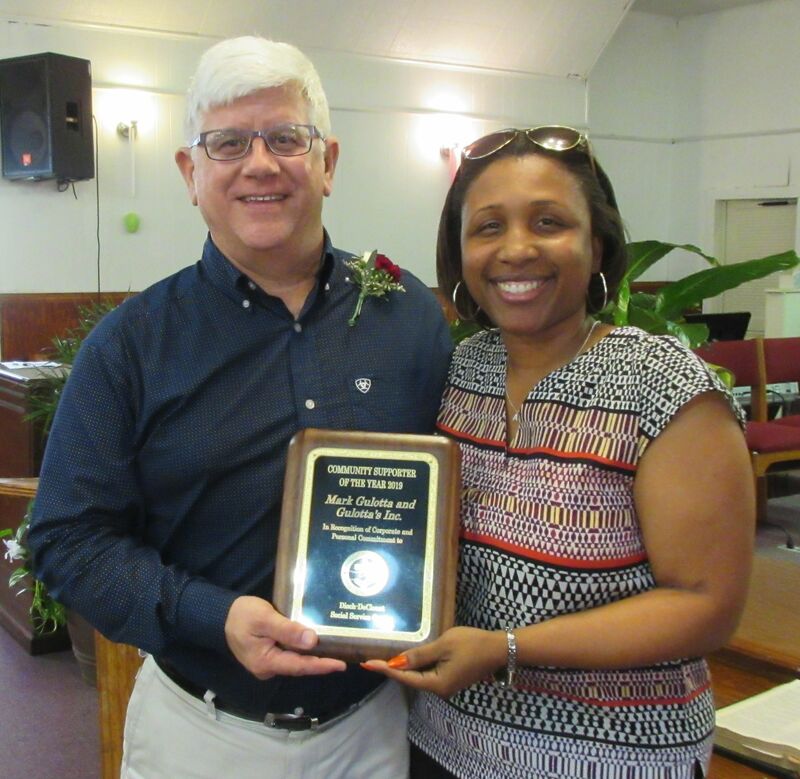 At the Center, Cassandra has demonstrated commitment and generosity in serving the poor and needy of Iberia Parish as a Receptionist, the first point of individual contact with the clients, for over 6 years. She listens to their requests with patience and compassion and provides them with critical information about the services available to them. Through her participation with the AT&T Pioneers, the Center has received monetary donations, knitwear and uniforms for school children. She and her husband, Donnie, prepare Christmas stockings with baby items and a toy or blanket for our clients’ children, 18 months and younger. They also donate Christmas toys for little boys. They put a lot of thought and originality into these toys, making sure they are appropriate and fun. She and Donnie prepare hygiene bags for homeless men and women who come to the Center. They are so grateful to get these items which they really need and which show that we care about them. Cassandra doesn’t ask, she just does anything she sees that needs to be done. She is always smiling, compassionate and caring, so that each client feels especially loved by her and Jesus. 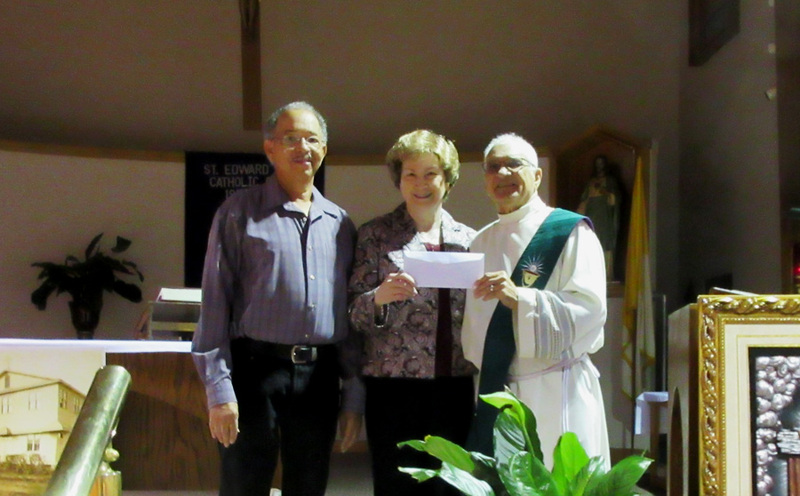 As part of the year-long celebration of its 100th Anniversary, St. Edward Church is having a special collection each month to help the poor and needy of the community. The first gift was presented by Deacon Raymond Derouen (right) to Louis and Carol Gaignard (left and center) of the Disch-DeClouet Social Service Center for the Milk Fund. The Pastor, Father Thomas Vu, and the Church membership wanted to give at least 100 gallons of milk to the children of New Iberia in honor of the Church's 100th Anniversary. 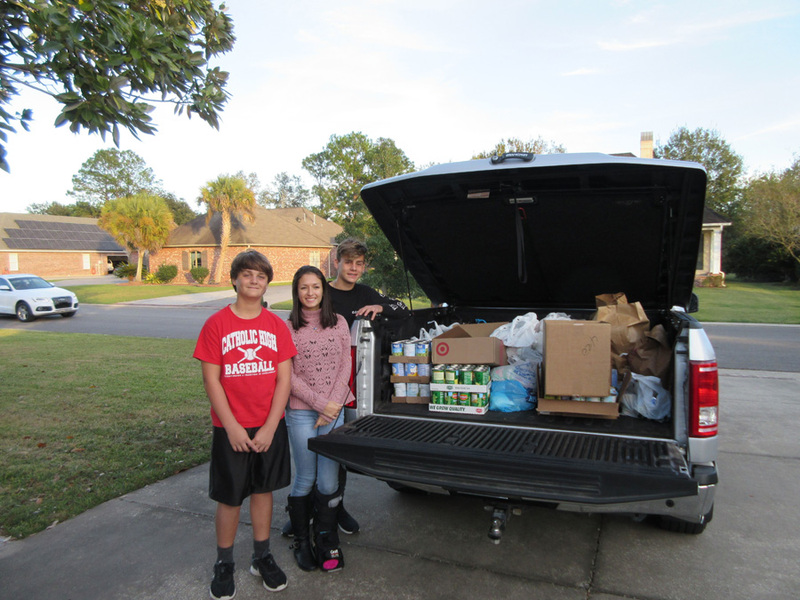 For the past 5 years Seagan and Ashton Segura have collected food for the Disch-DeClouet Social Service Center on Terrell Court in New Iberia. This year they enlisted the help of their cousin, McKenzie Briscoe, and added Astor Place to the collection area. Residents of the two streets were asked to put any donations outside the door and, with the help of Mom and Dad (Chris and Laurie Segura), the three cousins picked up the donations. This year they collected over 800 pounds of food from generous neighbors. It's all about neighbors helping neighbors in need. Center Director, Carol Gaignard thanked the Seguras for their annual project. "This family does something very meaningful together as a way of thanking God for His blessings. We challenge other families on other streets to do the same...Paying it forward." Other assistance including diapers, transportation assistance, burial assistance, I.D.’s, etc. 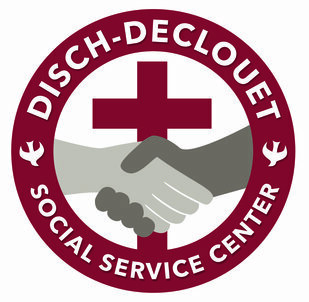 In the month of February 2019, 947 persons in 386 families were helped in some way at the Disch-DeClouet Social Service Center, including $13,873 in financial assistance, plus food, clothing, diapers, bedding and other non-financial assistance. Thank you for your prayers and financial support. It is truly needed and greatly appreciated. God bless you. Recently, a father of two children who is losing his eyesight came to the Disch-DeClouet Social Service Center for help. He and his wife needed help this month because he was unable to work. We were able to give the family 4 gallons of milk, food and help with the electric bill. He was very grateful and asked for prayers that the treatments he is taking for his eyesight help. Please remember our Annual Lenten Campaign in your prayers.